Pray for Ukraine; Welcome to Hell; Great Lent is coming. Major Archbishop Sviatoslav Shevchuk, the head of the Ukrainian Greek Catholic Church, asks that believers would recite the Our Father and Hail Mary daily for a successful transition in Ukraine. Also, he asks that those who recite the Rosary would add Ukraine’s peace to their intentions. At this writing, ex-president Yanukovych has not been found, but a new cabinet has been installed, and Arseniy Yatsenyuk named prime minister. In order to stabilize the country and meet future requirements, “extremely unpopular steps” will be taken. The former government was basically a kleptocracy, with authorities at all levels stealing and demanding bribes, and they have left the economy in shambles. “Welcome to hell” was his comment to the BBC after being presented to the camps at Maidan square. So, indeed, Ukraine will need a lot of prayer to weather the difficult months ahead: see this 60-second BBC video that lays out the financial crisis succinctly http://www.bbc.com/news/world-europe-26359957. In Kiev, mourners continue to pile flowers at the sites where people were shot down, usually from above by snipers. The people do not want a return of the old political class: too many have died, others have been wounded or brutally tortured. The new cabinet has to explain everything carefully and obtain the support of the middle-class, industrial workers, and farmers and other rural dwellers in order to manage the serous cuts that have to be made so as to save the Ukrainian economy. Russia’s promised loan is now a thing of the past, and all are waiting to see what Russia will do about supplying natural gas to heat Ukrainian homes as well as all of its public institutions, factories, and medical centers. Winter is not over by a long shot. The Berkut has been dissolved, many policemen have been asking for forgiveness from the people who they were supposed to protect, not torture, kill or press for bribes. Great Lent begins next Sunday night for both the Orthodox and the Greek Catholics, and it does so with the Forgiveness Ceremony. In that, people and clergy ask forgiveness of each other, and many times people in the congregation will exchange a kiss of peace and ask for forgiveness. It is also an opportunity to extend forgiveness to those not present, and surely this year, priests will call for forgiveness of the former rulers and their minions who perpetrated such atrocities on victims, and ruined the nation. Christians only accounted for about one-third of the population, thanks to many years of Communist anti-religious propaganda in schools, workplaces, and the media from 1918-1991 in the eastern and central oblasts. Believers from the western oblasts who have moved to the center and east for work and opened their Greek and Roman Catholic churches, or reclaimed old Roman Catholic churches that were put to degrading uses such as public toilets in the place of the former altars. But it will be a long time before that two-thirds of the country can be brought to God, as Orthodox infighting among the three Churches scandalizes people, and fierce anti-Catholic propaganda by the Communists and many Orthodox makes life hard for Catholics of both rites who need to open new churches especially in the eastern oblasts where people had no neutral education. I hope that the message of Christ’s forgiveness and the reality of the need for patience will permeate all levels of Ukrainian society. The opposition has been heroic in their resistance, and most of the world has been impressed by their peaceful tenacity. May they be as tenacious in the first several months of restructuring. Those months are critical in the formation of a democracy. If they can weather those tough months, then it will be smooth sailing ahead. 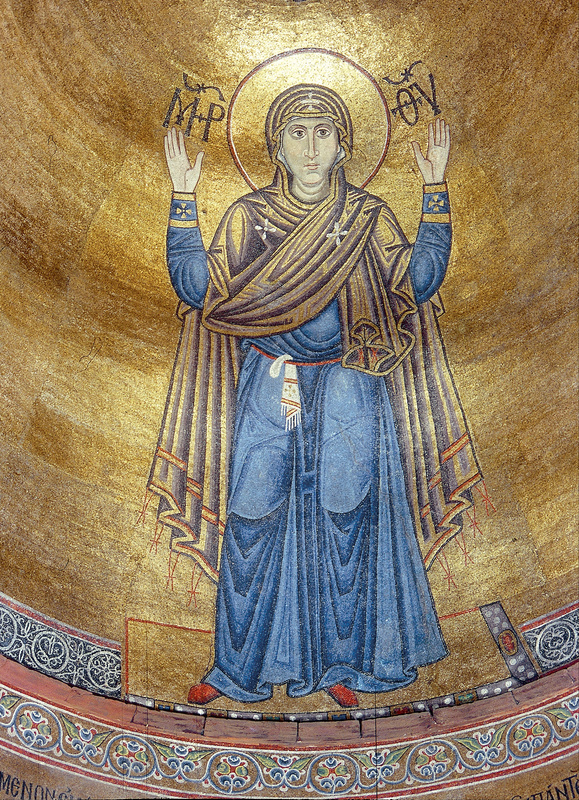 The Virgin Orans, or the Praying Virgin, in St Sophia in Kiev. The handkerchief on her belt is said to be used by her to wipe away the tears of generations of Ukrainians who have come to her, weeping while praying heir petitions. O Lord, strengthen Your servants and help them all to listen to Your Holy Spirit and to accept sacrifices as a necessity to obtain a brighter future for their children. Grant that the scourge of abortion in Ukraine will come to an end, so that the country will have a healthy demographic structure instead of killing its future citizens. Above all, may the peace of the Prince of Peace reign in their hearts, so that there will be no more bloodshed, no more tortures, and no hatred. Through the prayers of Your Holy Mother, the protectress of Ukraine as on the wall of St. Sophia, may Ukraine find peace, prosperity, forgiveness, and a spirit of gentleness. Amen.